So I took his BP. His brachial pulse was real easy to find, so I knew I had my stethoscope in the right place. 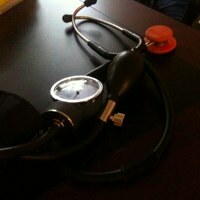 But the tube of my stethoscope was next to one of the tubes from the BP cuff. It was swinging which gave a rhythmic noise in my ears starting up high in the 140-150 range. But I thought, “That doesn’t sound like a pulse.” So I hung on until is got a sound that did sound like a pulse, and got a correct BP. The interesting thing is I now know what a BP pulse sounds like. When I started it was hard to tell if I was getting a BP at all because I wasn’t sure what it sounded like. But a number of in-class vitals sessions, doing dozens during my hospital clinicals, and practicing on my family, I now know what a good sound is. Newbies, this is why practice is so important. It teaches you what things are suppose to sound like, so when you get something wrong, you know it. Put your BP cuff on upside down, with the tubing closer to the shoulder than the wrist. As long as you have the artery marker on the cuff aligned correctly, it won’t be any less accurate, and it’ll get those hoses out of your way. Good tip. I’ll try that next time. most cuffs are designed so that you can remove the gauge from the actual cuff and place it in a location for better viewing. Doing this will also move at least one tube out of the way. I personally don’t like removing the gauge so I cut the gauge tube so that it barely reaches the gauge and still connects.